There is no doubt that you would want a way to end up with the best knee wraps that can help you with the exercises. According to several studies carried on the effects of knee wraps, they store energy in the wraps will increase the total power output in a person during the squats. For those who have used the wraps before, they can agree that it helped them perform the squats faster than ever. The knee wraps are amazing in the sense that they will help you put more force towards the ground during the workout. This means that you get to come up faster from the ground. The elastic nature of the wraps makes them store more energy in the wraps when descending; then that energy is unleashed to drive you upward. In such a scenario, your knees will not be doing a lot of work. Stability is another thing to note when using knee wraps for squats. Normally some people would have the problem of the barbell weights moving forward and backward whenever coming up. The knee wraps will help you achieve the right stability needed when pushing back up. On overall, the knee wraps will help you have a better experience of working out with the squat exercises. The knee wraps come in all shapes and design, but here are some of the top knee wrap types you can get on the market today. These wraps are commonly used by powerlifters and champion strongmen. These knee wraps will have a rubber design that fits extra tightly to ensure that it offers the right support for the knee. The design will grip firmly to the skin, eliminating the need to chalk your knees just to keep the wraps in position. They have the name as they have been endorsed by a former weightlifter Tommy Kono. The athlete used the wraps for a while and he just liked them enough to promote them. These wraps have a special type of elastic fitting that will the knees stable and supported at all times. These knee wraps are designed with elastic material made from cotton. Since it is cotton, you can always be sure that it will keep you feeling cool as the material is breathable. The elasticity of the material will also help with increasing your speed of squatting and controlling the squats too. These knee wraps are often the thickest of the bunch. 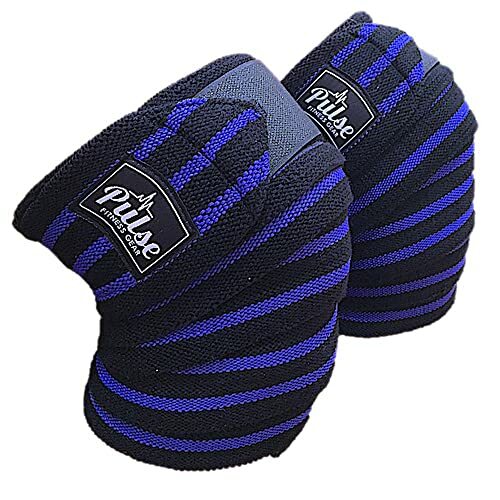 They will commonly feel heavy on the knees, but provide the best protection for the knees. It is also extremely built for those people who are looking to do wide ﻿﻿stance squats. With many Knee Wraps for Squats on the market today, not all of them will give you the right flexibility or support you need for squats. The following wraps have been carefully selected to help you with your squatting exercise today. The package is sold as knee wraps and wrist wraps. This comes quite important if you have to keep on working out various types of exercises. The wraps are made of high-quality material just perfect for supporting the knees and wrists when working out the squats. If you have experienced broken knees or wrists, then you do not have to feel the pain again when using these wraps. The design of one size fits all should be great for most people. You do not have to worry about looking for your perfect size. The design also makes it easy to wear and take off the knee wrap with a lot of ease. This has made the product to have various applications other than squatting. You can still use them for powerlifting, yoga, bodybuilding among many others. When you talk about knee wraps, most people only think about the discomfort they are likely to get when wearing them. You can forget about the discomfort whenever you get this model. It will provide you with the best comfort and support feature you need for squatting with heavy weights. The product is constructed with extra heavyweight material that is still elastic for maximum support. The support you get is unmatched when comparing it to most knee wraps on the market today. With such impressive support, you can expect that it will provide you with the best support for the grueling knee and leg workouts. You could still use the wrap for cold pack therapy. This is where you get to heal your injured knee faster than when not using a knee wrap to keep the cold pack in place. Probably in the past you may have had problems with wearing or taking off the knee wraps. All the changes with the Pulse Fitness Gear knee wrap. They are designed to be easy on and easy off. The industrial strength Velcro found on the product will prevent it from slipping after you have tied it around the knee. You will no longer have to keep on tucking in, the wraps to prevent slipping. The model comes with extended length of about 80 inches long and 3 inches wide. With such a size, it is for sure one size for all. You can always adjust it to fully fit you whenever you need depending on the knee size. The product should be easy to clean as it is machine safe. You do not have to worry about the elasticity as it is maintained even with continuous washing. If you always had trouble when closing the knee wraps, this one will get you doing the squats correctly and with ease. The hook and loop closure is what you need so that there are no more loose ends on when closing the knee wraps. The model is designed to be quite stretchable so that you do not have to worry about issues with losing elasticity with time. It will still be fitting you perfectly even after using it for a long time. The 72-inch wrap is what you need for the perfect wrap around the knee. The wrap will always keep you feeling comfortable and supported when going for the squat exercise. It is not just for support, as some people would want a knee wrap that does not fall off with time. You can be sure that this model will not unroll anytime soon once it is wrapped. The product is highly elastic so that you can easily fit it on any size of the knee. You will now be able to take on different types of heavy weights when going for the squat exercises. It is not just about the elasticity, but also the level of quality is also impressive. The material will last you longer than what most people would expect. The manufacturer made it to be longer so that you can easily have extended knee support all the time you are working out with squats. The fabric is designed to offer the best support and durability you have always wanted. Mava Sports Knee Wraps tends to show promises when it comes to having the best knee wraps for squats. The fabric is not just perfect for squats, but also you can use the same for powerlifting and cross training exercises you might have. It also gives you superior comfort at all times when wearing it. Starting today, your squatting workout will never be the same again. You need to workout better and correctly all the time. It is crucial that you get to choose the best knee wraps you feel will workout for you from the many mentioned above.